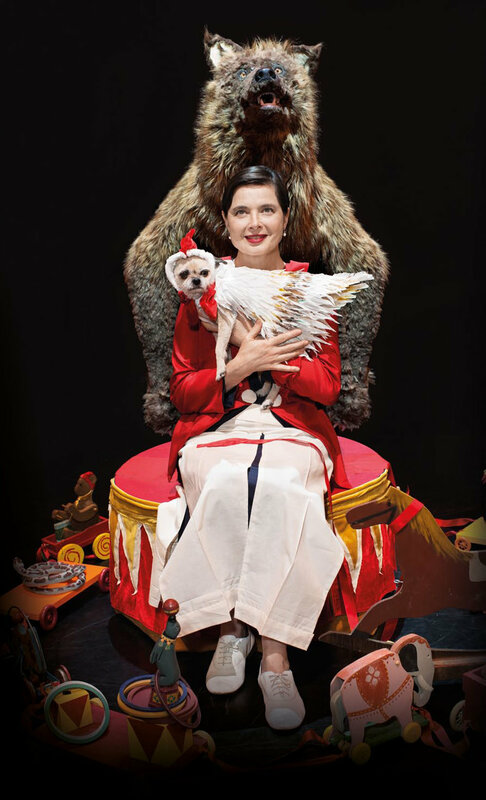 Hunter Theater Project will present Golden Globe Award-winning actress-filmmaker Isabella Rossellini in her one-woman, one-dog theatrical evening, Link Link Circus. The production will play April 18 through May 3, 2019 for 14 performances only at the Frederick Loewe Theatre at Hunter College, East 68th Street between Park and Lexington Avenues. Tickets ($42, $15 for students with ID, with no service charge) are available Wednesday, March 20 at noon at www.huntertheaterproject.org. Link Link Circus is a comedic and scientifically informed look at the link between humans and animals, via Darwin’s theory of evolution. Rossellini, a vivid monologist, explores the brilliance of the animal kingdom in a show illustrated with her short comic films, home movies, and animation. Rossellini transforms herself into Aristotle, Descartes, a medieval theologian, B.F. Skinner, Charles Darwin and other prominent thinkers of the past, while her dog, Pan, plays various animals, assisted by Andy Byers (for performances April 18-April 26) and Caleb Lane (for performances April 27-May 3). Link Link Circus addresses the latest scientific discoveries about animal minds, intelligence, and emotions. Rossellini is completing a master’s degree in Animal Behavior and Conservation at Hunter College and has received a PhD Honoris Causa from the Science Faculty at University of Quebec at Montreal. She has said that her true calling has always involved animals.